One of the funniest memes I’ve seen over the past few months as I’ve scrolled through Facebook depicts a woman dramatically wailing into her hands and asking the question, “Why do they want dinner every single night? !” Several months ago, I laughed to myself when I first read this sarcastic assessment of the stress of meal planning and preparing. Now, I read it with a different perspective and appreciation. What a privilege it is to expect a meal every night (and 2 others during the day.) And how unfair that there are children – 200,000 just in Arkansas – who don’t have this expectation because they don’t know from where their next meal will be coming. In June, I was challenged along with some coworkers to participate in what’s called the SNAP (Supplemental Nutrition Assistance Program) challenge for one week some time during the month of September as part of Hunger Awareness Month. The idea is to live on what someone who received SNAP assistance (formerly known as the Food Stamp program) would live on each day – $5.00. So, if your family participates in the challenge together you have $5 per person per day to spend for one week. This meant we had a total of $75 to spend on groceries without using anything already in our house besides spices and condiments. Find out more about the SNAP Challenge. I will be honest that I dreaded and procrastinated preparing the meal plan and grocery list until I absolutely had to get it together before the trip to the grocery store. To have to be so intentional and careful is time consuming and mentally exhausting. While I thought I stressed about keeping our grocery bill down each month, I realized very quickly that I really have it quite easy still when it comes to shopping. I meal plan, but get to choose menu items based on what I’m craving or what looks like a fun recipe to try. I rarely stress about what kind of meat it calls for or if it calls for more expensive items like fresh produce. I simply write down the items I need and go get them, hoping I stay in a range for the grand total but not having to put items back if I’m over. I think this is what I was scared of the most…what if I didn’t estimate well enough and I had to put something back? My heartrate went up and I felt my cheeks get red at just the thought – the thought – that someone may see me have to put something back because I was over my set total. Man, talk about a punch to the gut. I’ve never realized the pride that’s wrapped into simple actions such as checking out in the grocery store line until this week. My husband and I made a plan. We’re used to have 2 large meals made at the beginning of the week and then alternating those back and forth for dinners. Sometimes we take them as lunches too, but several days each week are spent eating out for lunch due to convenience or just wanting a particular dish from a particular place at a particular time…again, what a privilege. We decided on Taco Soup, Tomato Soup with Grilled Cheese sandwiches and Breakfast for Dinner. I supplemented with applesauce, lima beans, bananas and cantaloupe as the vegetables and fruits for our week because these are the four current favorites of our son. 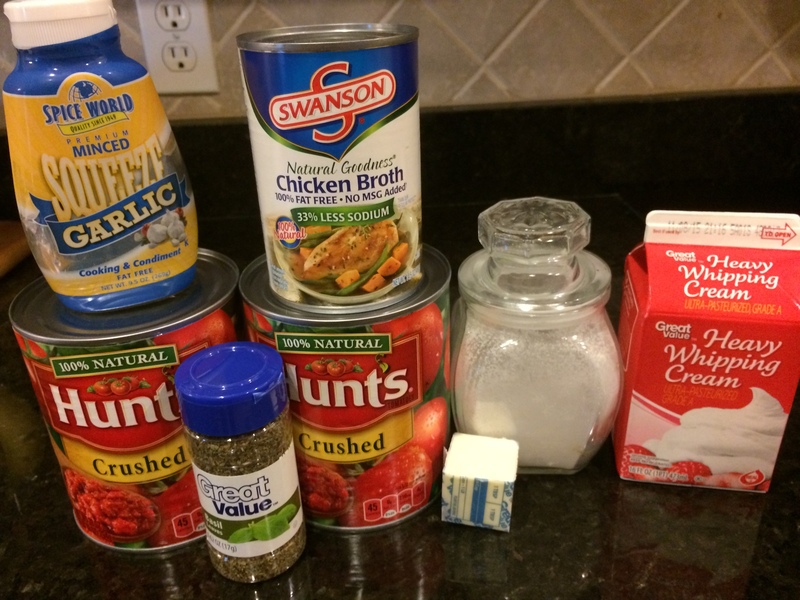 To save money, we decided to use ground turkey instead of beef in the Taco Soup (saving $2.00) – also healthier! For the Breakfast meal we used Turkey bacon which is anywhere from $5.00-$8.00 cheaper than pork bacon. This was not a change for us, however, because we actually prefer turkey bacon. I also chose non-organic milk instead of organic which I’ve been buying since my son starting drinking milk, saving $3.06. I also purchased the cheapest eggs available instead of the brown cage free that I regularly purchase which saved $0.99. When I got to the bread aisle I noticed that a different brand of bread than my regular one was on sale for $0.53 less so I purchased a loaf of it instead. My total came out to $58.36! I was so surprised at how frugal I was apparently capable of being. I did go back and account for the 5 k-cups my husband will use this week (one per day) and the 3 that I would probably use since I don’t drink coffee every day. They average about $0.75 each so that brings the total to $64.36. Buying store brand items, not buying anything not involved in the main meals of the week (i.e. dessert, sodas, etc. ), using coupons, substituting cheaper proteins or other items, and finding meals that make plenty of left overs are some great tips to make your money stretch as far as possible. Combine tomatoes, garlic and broth and bring to a boil for 10 minutes. Reduce the heat to low and stir in sugar and butter. Mix until they are dissolved, melte d and well combined. 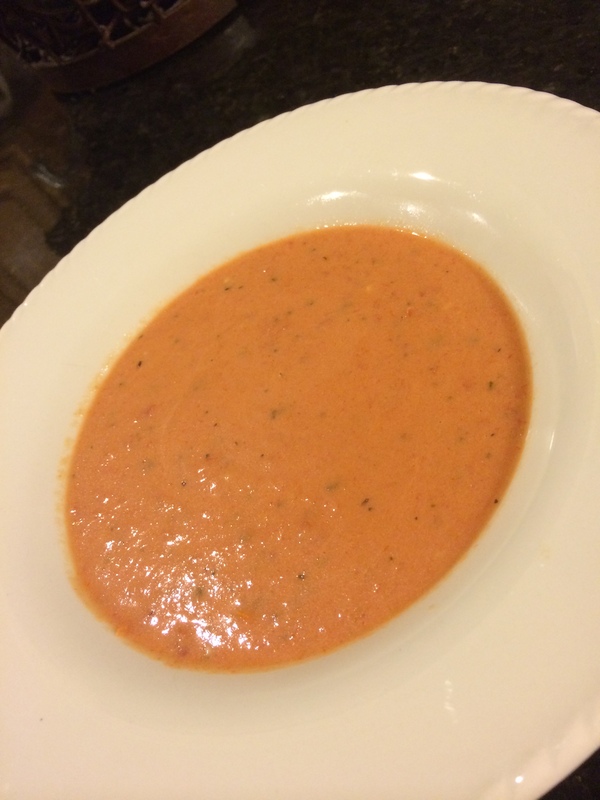 Very slowly pour in heavy cream while continuously stirring until all cream is combined and soup is creamy. Stir in basil. Good served with croutons, grilled cheese, or just a little parmesan cheese on top. One pot of soup makes 5 meals for 2 people. I freeze them by batch so they can be thawed quickly. This challenge has definitely taught me a few things not only about Hunger Awareness in general but also about my attitude towards food and the role in plays in daily life. Here are a few of the observations I’ve made so far, but I’m sure more are to come as I continue on the journey this week. First, as I stated above, I have been struck by the amount of pride I feel when it comes to the ability to buy what I want, when I want it. Having to be so careful with the threat of having a debit card not go through or not enough cash on a weekly or monthly basis would wear on my mental and emotional state in ways I’m not fully prepared to admit to myself. I can’t begin to imagine the stress it causes for those who live this routine regularly. Second, I had to make the conscience decision to not buy what I normally would for my family…this was most evident when it came to organic food and fresh produce. I did pain-staking research when I became a parent to make myself feel most comfortable with what food to purchase and provide for my child. Now, by no means do we eat all organic or not eat processed foods, but I had decided early on to make the switch to organic milk and eggs because I felt they were small changes in items that we consumed very regularly. Having to decide not to provide that this week was another punch to my gut. Cue the mom guilt. I’ve been thinking about those parents who have to decide how to provide food in general, not the healthiest kind of it, for their children. Bless their hearts. Truly, bless their hearts. Third, my husband and I have found that we both have jobs which provide opportunities to provide meals for us occasionally. I tend to think that this is generally not the same situation for those who are working and having to use the SNAP program. Just this week alone I will have 2 lunches provided – one because I was at a retreat for work and the other because I will be at a meeting over lunch. My husband will have at least one lunch provided this week for similar reasons. It’s quite convenient but this week has me wondering if we’re the ones who are in true need of free meal here and there as part of the hard work we put in at the workplace. Fourth, there is no room for luxury or extras. I did not have ice cream in the budget this week and therefore will not indulge is my 110 calorie cup as an afternoon snack. I went to pour myself a glass of wine last night and was reminded by my husband that the bottle was not purchased this week with our budget money and was therefore off limits. Seriously?! The feeling of restriction quickly angered me. But just a quickly the anger subsided. Then, I wondered what real items are being sacrificed by families in order to just make it through to the next pay check? While dessert and wine are very real to my middle class life and standards…I know much more is being missed out on, causing anger, sadness and resentment in families across our state and our country simply because they’ve had to say “no” yet again. I’m so glad to have participated in this SNAP challenge. I’ve done poverty simulations before as part of retreats and trainings. But never before have I had to live in the situation. The meals planned are not the focus here, as I assumed before I really got started. Instead, the emotions, the inability, and the opportunities not available have shown themselves to me in ways I would never have realized by just reading about hunger or poverty situations. It doesn’t stop with being aware. I must find the best way to be in action. I must do more to care for my neighbors as God calls me to do. My prayer is to continue to feel this “punched in the gut feeling” until the 200,000 children who are hungry in Arkansas can go to bed without their own “guts” growling. Find out more about 200K Reasons by following the Initiative on Facebook. But so many times those blissfully hopeful weekends end with half-completed projects strewn about the house or garage with frustration and exhaustion mixed in among the tools, hot glue strings, trash and countless other things that were neglected as you attempt to just finish this one thing before you have to return to work the next day. Obviously, I’m speaking from a purely hypothetical experience. Not once have I ever started 6 different projects in a weekend and not have the supplies or time to finish any of them and nearly driven myself to a nervous breakdown when I had to return to my normal schedule on Monday with half the contents of my kitchen drawers splayed on the kitchen table because I had yet to find organizers that would fit in said drawers. Nope, not me, just guessing that this happens to people. So how do “people” avoid this trap of the DIY weekend? I think there are 3 main steps to being prepared for the weekend project(s). First, I figured out what storage pieces I wanted to keep and what kind I wanted to get so I would know the skeleton of what I was working with as I started purchasing items. I have taken a general stock of what’s in the garage knowing some things will be thrown out, some will stay and some will be reduced. I have taking pictures on my phone so as I have shopped I know what I have that I will be organizing – what tools, what toys, etc. I took measurements of the shelves so that I would know what storage containers would fit and if more than one would fit on a shelf together. Have a plan! As you shop to get prepared for your project be sure to find a store that allows you to bring back unused products and over buy. 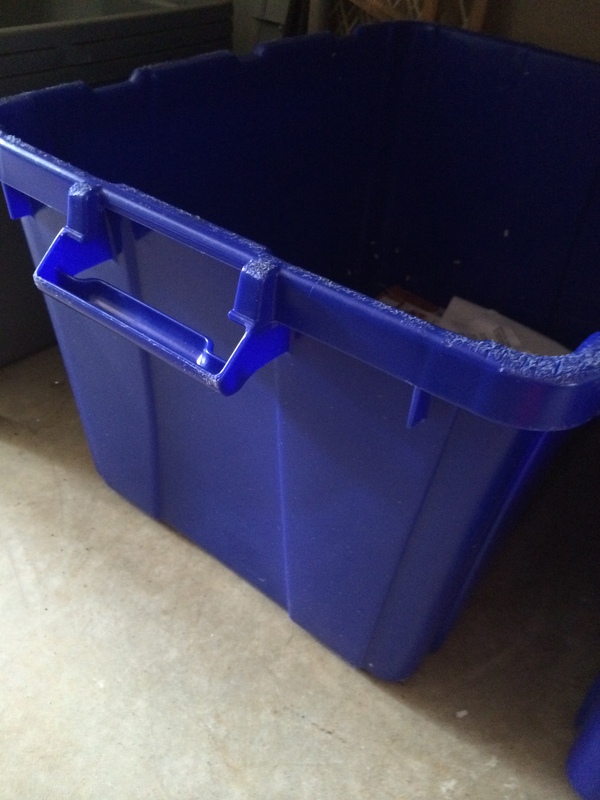 This will save you time as you organize, build, clean, etc. Use what you need so you can complete the project in one time setting. Then, return the unused items either that weekend or later the next week. This saves you from losing motivation, getting distracted and from losing time on unnecessary trips to the store. 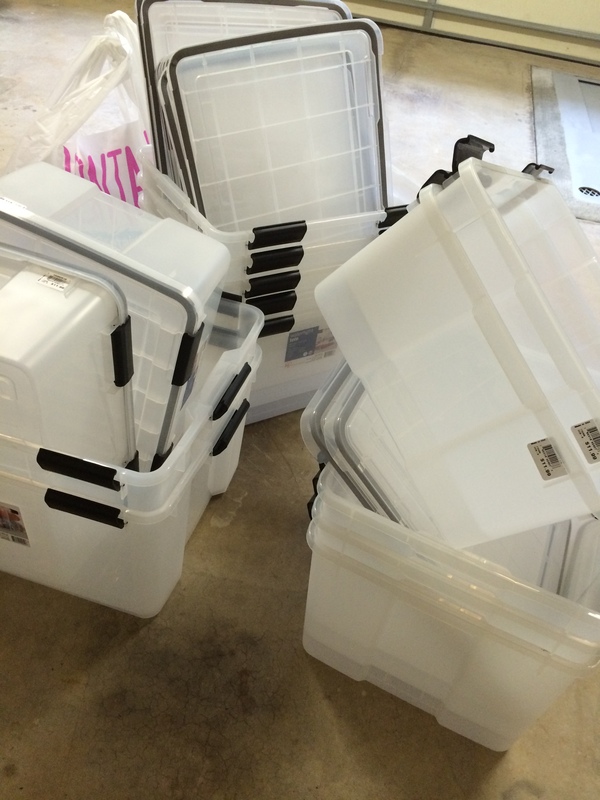 Right now I own about twice as many storage boxes as I will need in various sizes and shapes. 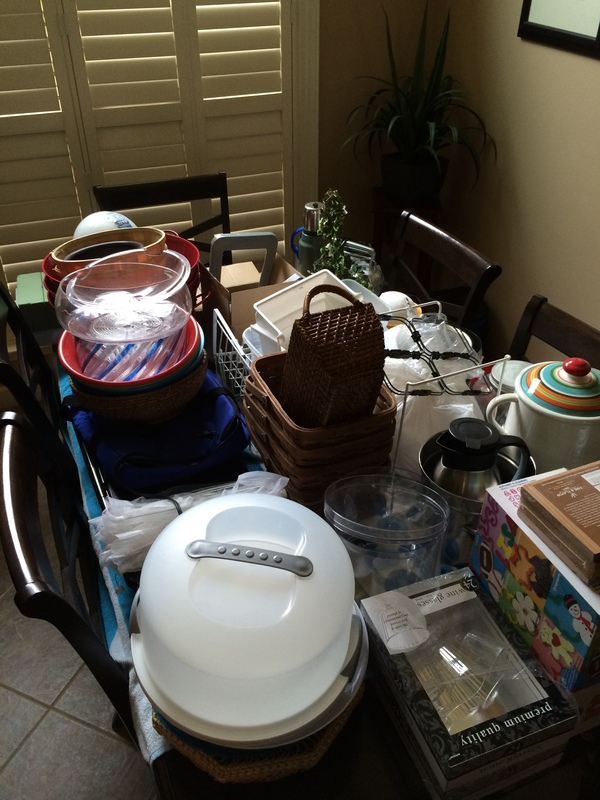 However, I will be able to organize all that stuff on my dining room table without stopping because I have options. Then, next week I’ll just easily return what I didn’t need. In the day and age of Pinterest we can get caught up in the idea of DIY. While creating something from nothing can be rewarding, it can also be something we end up investing way more time and/or money than it’s actually worth to us. So, as you begin planning your projects ask yourself why you want to do them. Are they just for practical purposes? Or will the creative work bring value to them for you? Will the work you invest in them truly be saving you money or could you purchase a completed item for about the same amount? Some projects are worth the effort, others are just a headache and would end up on the Pinterest fail website if the right people saw them. I’ll give you an example of how I used this step myself recently. 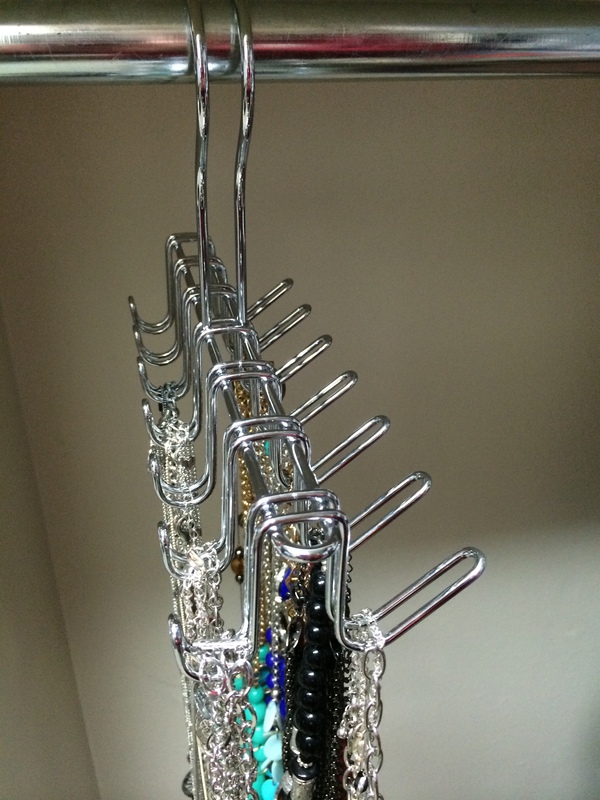 I have always kept all my necklaces on one large hoop that hung on a single hanger in my closet. It did the trick to keep my necklaces untangled most of the time but it was hard to see them all and I ended up forgetting about most of the ones towards the back because they stayed covered up. So, I decided that I wanted to reorganize my necklaces. First, I laid themout by design and color to see what I was looking at as far as number of hooks, etc. Then, I got on Pinterest and started investigating how to go about making something of my own. There were some great ideas, but the issue for me was that I wasn’t looking for a whole lot of frills, I just needs something simple to hang my necklaces on that didn’t take up much space and didn’t take a lot of time or money to make. Then, I decided to look at Amazon to see what they had. After a few word searches, I came upon this belt and tie hook for $7.99. It’s exactly what I had in my head and it was cheaper than any of the supplies I was going to have to purchase for the projects I had just spent 30 minutes looking at on Pinterest. It’s working beautifully to keep my necklaces organized by color and design and I spent less than 30 minutes unpacking it, sorting necklaces, and hanging them up! Do you constantly struggle with the battle between the never-ending tasks of maintaining a household while also trying to figure out how to actually spend time with your family? Too bad our families don’t think “Fold the Laundry Night” or “Scrub the Toilet Night” is ideal quality time. That would solve everything! But, since toddlers would rather sit in the laundry basket and teens don’t even know where the laundry basket is, I guess that fantasy will stay in my head. So, in the meantime, I have figured out some tricks to keep up with housework each day so that sanity is maintained while also not spending too much time on any of it so I still spend time with my family each night. I’ll tell you about the first step today and share the rest soon, so stay tuned! The key is to this method is to know yourself and the areas that truly make YOU cringe. I mean, what makes you grimace, roll your eyes and start your day off in a bad mood when you see it first thing in the morning? Is it the sink full of dishes, dirty countertops, clothes on the floor, shoes by the door, a floor that hasn’t been swept, something else? Pick your top 3 cringe-worthy areas in the house. Mine are the kitchen sink, the kitchen counters and the living room couches. Okay, got your 3 areas in mind? Let’s move on. Now that you’ve picked your 3 areas, you need to develop your routine. Every night before going to bed, I make sure the kitchen sink is empty. Usually this is done after dinner during clean up, but I double check that there are no glasses left from the rest of the evening, etc. Then, I clean the kitchen counters. It’s incredible to me what a few swipes of a paper towel can do to one’s perspective. Finally, I straighten the couch cushions, fold the blankets and straighten the items on the end tables next to the couch. All total this takes about 10 minutes each night. But it makes my mornings start on a good note because the areas that bug me the most and make me feel like the house is the dirtiest aren’t staring me in the face as soon as I come out of the bedroom. The only way this works is for you to pick the areas that truly drive you up a wall. It might be something small or something that doesn’t even bug anyone else in the house, but if it’s your trigger, that’s what you need to focus on each night during the week. While we’d all love to wake up to a sparkly, shiny home every morning, that idea is just plain delusional. So instead, make sure to wake up each day in a home that at least has your 3 most cringe-worthy areas as sparkly and shiny as possible so you can just make it through the week. So during the week while I might not have time to clean, I do at least wake up knowing that the things that could get under my skin the most are already starting off clean, straightened and ready for the new day. Quick & Easy Dinner Coming Right Up! I think one of the toughest parts of our duties of “home” is actually just keeping up with what we have to get done. Keeping up with a to do list is one thing, but actually working a to do list is another. Whether you keep it electronically, on paper or a combination of the two, if you don’t have a clear plan to check items off, add things to it and evaluate it at certain intervals it will seem like a never ending and overwhelming process. Last week I shared how I keep up with my work task list using the GoodToDo.com site and app. For a little more info about my take on to do lists and the GoodToDo Site and app, you can read that post here. 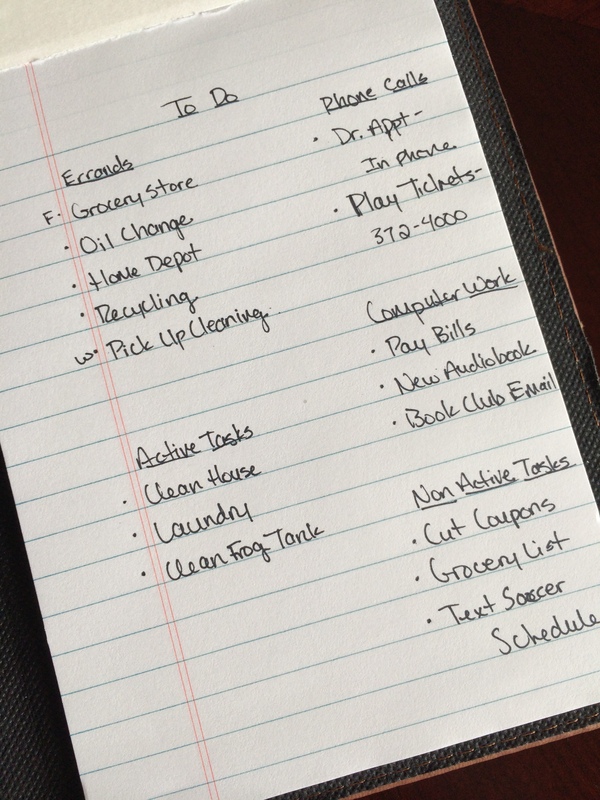 I also have a personal category in my GoodToDo list that helps me keep up with recurring weekly personal tasks such as cutting coupons, grocery shopping, cleaning house, laundry, etc. and monthly tasks such as the month’s menu, my son’s picture calendar, pay bills, etc. I also use the GoodToDo list to keep up with personal tasks that are farther out than one week so that when I get to that week I will remember to take care of them. For example, if we get an invitation to a wedding I will put a task saying “purchase wedding present for so-and-so” on the Friday of the week it needs to be purchased. I put all my personal tasks on Fridays so I that when I go to make my to do lists on paper for the week I know where to look and have one master list to go off. So, each Sunday afternoon I make my to do list for the week on paper. I use paper for my personal to do list for a couple of reasons. Second, I need to be able to see my whole list on one page so that I can quickly scan it to see what I can get done in the time available. The GoodToDo site and app are great in a work setting, but harder to see as big picture. Third, I don’t need a record of my accomplished tasks like I do in my work setting. I love that I can track what I’ve accomplished every day using the GoodToDo app, but no one is going to ask when I wrote the grocery list, so it’s not as important to have the electronic preciseness for my personal tasks. 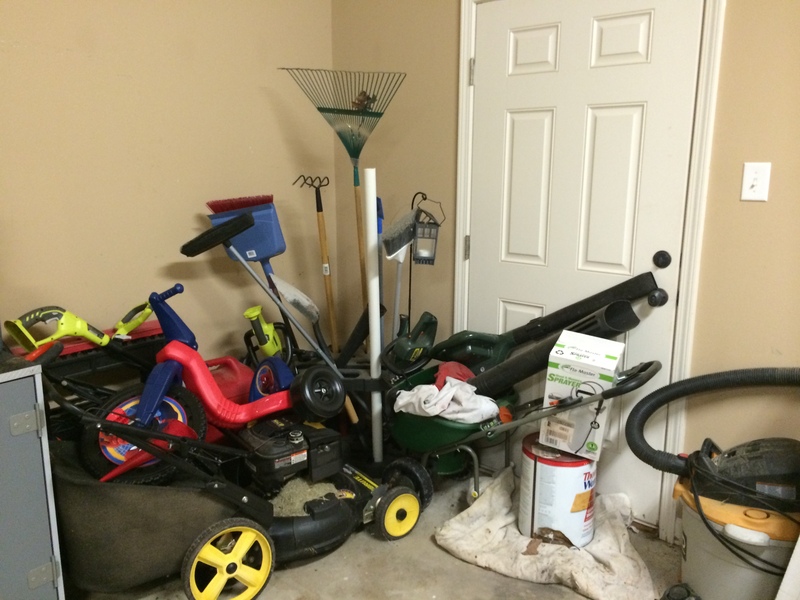 Active Tasks – I count these tasks as ones that will require energy and me to be up and moving at the house such as cleaning, doing laundry, yardwork, cleaning the frog tank, etc. Non-Active Tasks – I count these tasks as ones that will not require a lot of energy or could even be done while sitting on the couch such as cutting coupons, sending a text, making the grocery list, etc. Having categories helps me use every spare moment of time rather than staring at a jumbled list of 20 tasks and trying to figure out what I could get done next. If I have a larger chunk of time I can look at the active list and get one of those tasks done. But, if I only have a few minutes before my son wakes up in the morning or if I’m tired at the end of the day and ready to sit on the couch, I can just pick one or two things off the non-active list to get done. That way I still get a couple things accomplished but without a lot of effort. In the same thought, I make phone calls when I have downtime in the car or if I’m in waiting room. To help speed these calls up, I write down the numbers on my to do list on Sunday when I’m making the list so as soon as I have a few minutes the number is right there for me and I don’t waste time looking for it. I also look at my errand list and assign each task a day of the week if I know that I’ll be in the area of that area already one day in order to save time. Then, the rest of the errands get fit in when possible or on the weekend. It’s important to look at your list each morning and evening to remind yourself what’s left and to try to do a couple of things each day so that you don’t leave yourself a long list on the weekend. You have to shape your list to your family’s needs and your family’s schedule. I try to accomplish everything on my to do list by Saturday evening so I have Sunday to relax and enjoy downtime. This creates less pressure than a daily to do list because some days are harder than others and I just want to do nothing by the time dinner and the bedtime routine is over. Other nights I have enough energy to accomplish a few extra tasks. By working a weekly list, I have flexibility without feeling guilty or pressure. Sometimes it works, other times life happens and it doesn’t work, but it’s a good way to look at your list as having a beginning and an end so it doesn’t feel like it just keeps getting added to week after week. Each Sunday, I make a new list and add anything from the previous week that didn’t get done to it so I always start with a clean list. 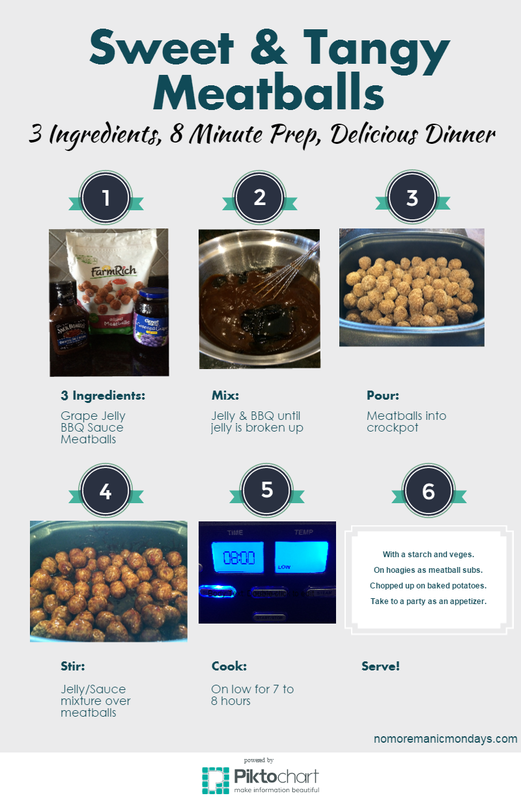 When I first learned about Pinterest, I pinned every possible pin I could find that had to do with meal planning. I just knew that I was going to find the perfect fix to my constant annoyance known as dinner. I despised coming home just to stand in front of the pantry as if boxes and cans were going to just fall off the shelves at my feet as if to say, “cook me!” We ended up going out to eat way too much simply because we did not have a plan from week to week. We were wasting food because I didn’t know what we had so things would spoil or expire before I cooked them. When I got started on Pinterest, I spent hours looking through meal plans that gave recipes and shopping lists. But I couldn’t find anything that really worked. And it finally occurred to me that the reason these plans wouldn’t work is because the plans were based on the food, not on my family’s schedule. And so I was constantly trying to figure out a way to make these great plans with great meals work in a schedule that was unique to just us. So I decided to make my own meal plans and to start from the schedule side of life, then to plan the meals. 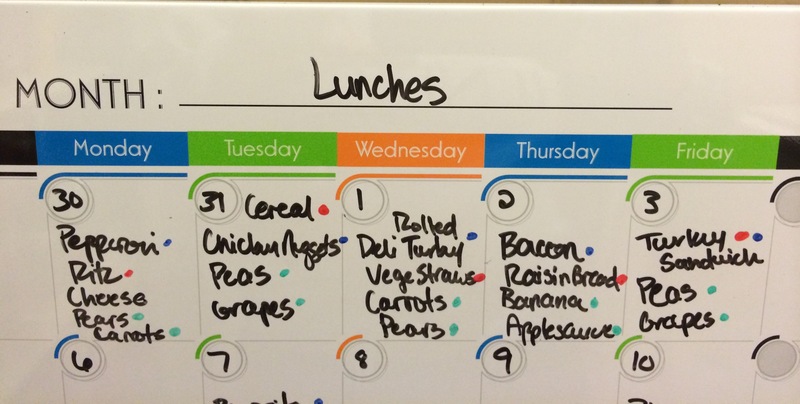 And so, here’s another blog with another meal plan! But this time, I hope to teach you how to create the layers of a plan so that the meals themselves are not what you’re trying to recreate. Instead, you are recreating a system so that no matter what the meals are, your family can stick to a plan, save money, and have less stress when it comes to meal times. To get started, you will need a few supplies and you’ll have to do a little prep work. Once the prep work is done, this process should take you an hour or less each month. Imagine only having to think, “What’s for dinner?” just twelve times a year!!! You will need a dry erase monthly calendar, a small blank dry erase board, and dry erase markers in 4 colors (I have black, blue, red and green). Find a place to hang both the blank board and the calendar near your kitchen. I have mine on the inside of the pantry doors. You need them to be easily accessible and easy to get to so you can not only see them but so that you can write on them. You need to do a full freezer clean out and evaluation. 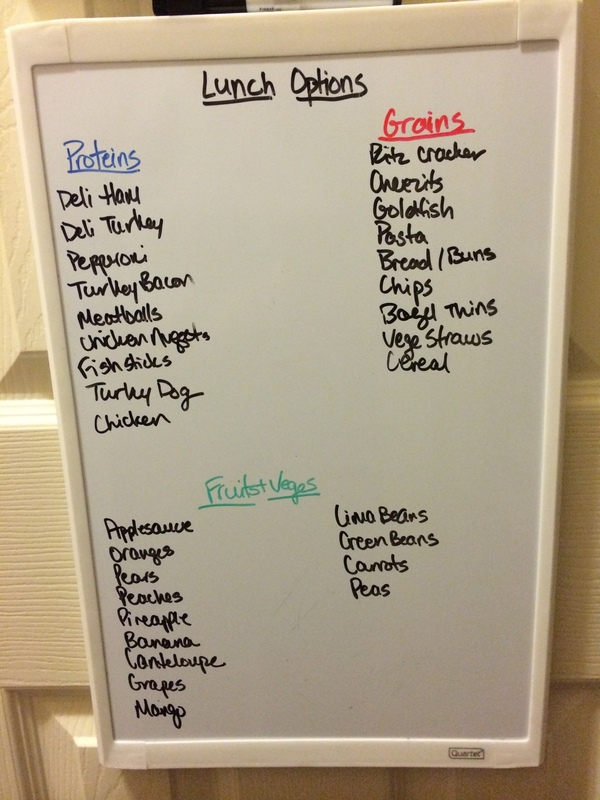 Make a list of everything in your freezer(s) and categorize on the blank white board. You’ll need your 4 dry erase markers and your calendar before you begin. After you clean off the board from last month, you’ll write the new month at the top and put the dates on the calendar. I use the black marker for this layer. 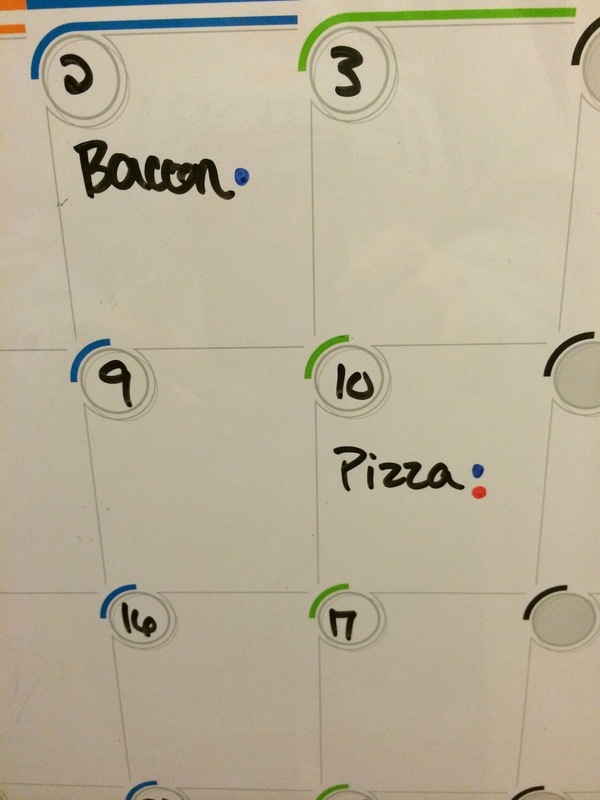 Next, using the red marker, you’ll mark any events during the month that will keep you from having to cook dinner at all. This would be if your family is attending an event where dinner will be served or you know that you’ll be out of town, etc. Next, using the green marker, I put a dollar sign on pay days and indicate the days that I’ll be going grocery shopping. This helps me be mindful of how many meals I plan that would require purchasing new ingredients (especially meat) so that I spread out the expense from pay period to pay period. Putting the grocery store on the calendar helps me keep know exactly what items have to be purchased for the meals on the board between store visits. Seeing store visits on the board also helps keep in mind to plan meals that need fresher ingredients closer to when I will have just been to the store. 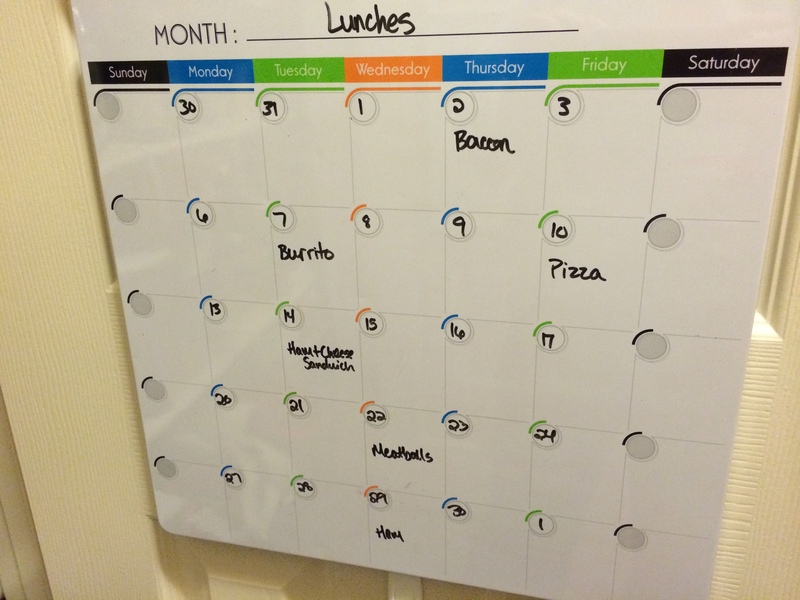 Finally, I use the black marker to put the meals on the calendar. See below for further details on how this process works. I ask my family if there’s anything in particular they want to add to the list of meals this month. I challenge myself to pick at least one new recipe from one of my Pinterest boards to try this month. I try to only choose 1 or 2 “new” meals each pay period that would require purchasing meat and new ingredients. When I make a “new” meal, I always double it so that we can eat it and so that I can freeze a batch. A “new” meal to me would be a new recipe or a recipe that I’ve cooked before but that I don’t have made in the freezer already. I try to put meals that require extra prep or cook time on Saturdays or Sundays so that I can cook on the weekends and enjoy the leftovers on weeknights. I love planning crockpot meals on Monday nights…there’s nothing better than coming home to a house that smells good and hot food! And if the meal takes some prep, you can do that on Sunday so that all you have to do is pull it out of the fridge on Monday morning and turn the crockpot on. I use the list of freezer food to fill in the majority of the month’s meals. These meals get replenished throughout the month as I freeze doubled meals and as I freeze leftovers that we just don’t have time to finish. As I choose meals or meat to use from the freezer list and put them on this month’s calendar, I draw a red line through them. And as I plan a “new” meal that will be doubled I write it on the freezer list in green. I don’t erase anything or write in black until I go to make the next month’s calendar because I’ve found that as the month goes, things will shift and some meals won’t happen as planned. If I already had the meals erased, they wouldn’t get put back on the board and I would find that they would get forgotten about in the freezer until they were too old to be eaten. So, I wait to be sure they really get used this month, and then I erase them. Same as the “new” meal… I wait to be sure it gets made, so that it doesn’t get added now but then really doesn’t get made this month for some reason. That way I won’t plan on it for meal for a future month and be disappointed when it’s not really in the freezer even though it was on the list. About twice a year I plan freezer meal prep days to restock the freezer (I’ll share those recipes and tips, no worries!) and give me a kind of cushion to build off of when going into the next 6 months of meal planning. I try to do this in spring and fall when the electric bill is the lowest so we are more likely to have an extra $150-$200 in the budget to spend on extra food those months. Good luck! And feel free to comment if you have ideas to share or have questions or need suggestions for your particular situation. I’d love to help! Keeping the Clutter Out of the House! I have enough junk in my house. 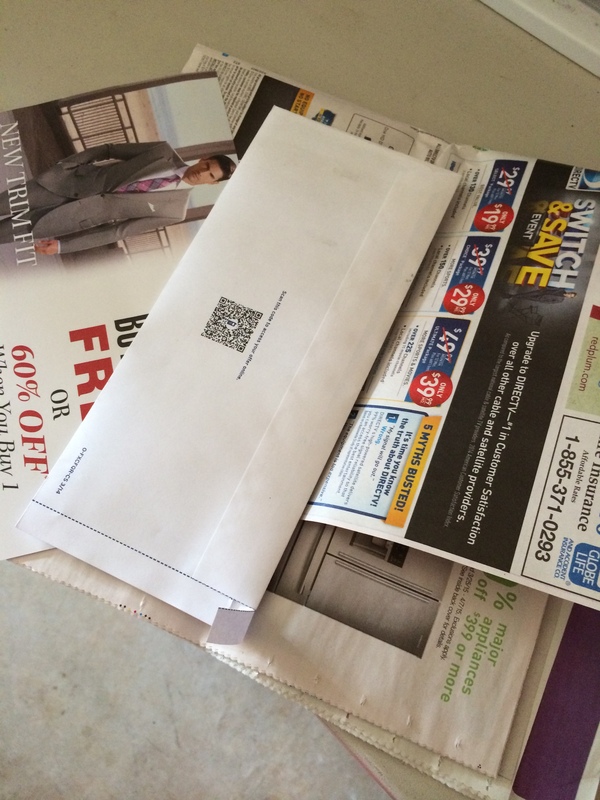 I don’t need more paper, ads, or crap to fill up counter space, the kitchen table or the precious garbage bag. So, I have a rule: the mail stays in the garage! It’s pretty simple, saves you from wasting counter space, keeps the garbage bag from filling up faster, keeps you from piling up more junk to have to sort through later, and keeps you from missing important things in the mail – if such things still come through snail mail any more. I pull into the driveway, get out, grab the mail, get back into the car, pull into the garage and turn off the car. Then, I open all other pieces of mail. I put bills with their return envelopes with my phone so I know that they’ll get carried straight into the house. If there are other cards, for example an appointment reminder, I look at my calendar on my phone to see if the appointment is on there, then add the card to the recycle pile. No need to carry it inside or add something to my to-do list when you can just take care of it right there! If there are any other items that can’t be taken care of in 30 seconds or less I put them with my bills that are with my phone and take them inside. Now I get out of the car, put the discard pile in the recycling bin and carry the others with my phone inside the house. Once inside, the bills go straight to my desk in their designated bill folder so they’ll be there when pay day rolls around. In less than 5 minutes a day, I have checked the mail, recycled some paper, filed some bills, and not created piles anywhere in my house or extra work for myself later in the week.